That helps explain why Sharma recently spent several days in—and above—Eureka, Calif., accompanied by a Red Bull film crew and a pair of scientists specializing in the world’s biggest trees. 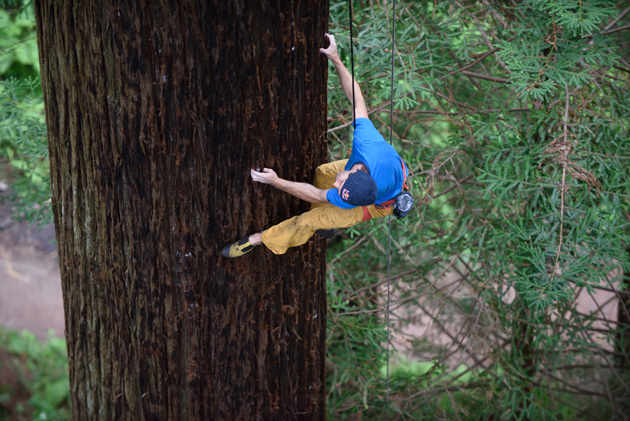 For a project dubbed “Giant Ascent,”Sharma free-climbed one of spectacular redwoods in Eureka’s Sequoia Park—spurred on, in a touch sublime and surreal, by the excited braying of donkeys in a nearby zoo. I won’t tell you how the climb ended, but I will say that he found the going much tougher than he thought it would be. While his chalked route took him straight up the tree, Sharma was, in a sense, coming full circle. After more than a decade climbing some of the world’s most extreme and technically demanding lines, the intent of his Giant Ascent was to return to his roots, “to get back to that playful side, being a kid, which is how I started climbing to begin with.” I drove from the Bay Area to Eureka, and spoke to Sharma just after he’d come down from a practice climb. SI.com: So how’s that going? Chris Sharma: Same as any new climb, there’s a lot of trial and error. The line’s there. It’s like a real, legit climb. It’s hard. Usually I’m super-trained to look at rock and identify features, and find a pathway. But when I look at the tree I just kind of … draw a blank. ’Cause there’s nothing to stand on, nothing to pull on … so it’s really kind of like learning another language. CS: I went to a private school in the Santa Cruz Mountains. During recess I would escape and go climb trees. When I was 16 or 17, I had what I called my Jedi Training Course. My friends and I had a whole circuit of rad tree-boulder problems, where you’re swinging from a limb, then at the apex of your swing let go, fly, and land on another branch, and have to stick it, and as you stick it, fall forward and dino to another one. These were actually cypress trees, not redwoods. ​So a project like this, did you take it on as a release, kind of a change-up from the high-pressure, high-stress climbs you’re known for? CS: Yeah, I’ve had lots of experiences on really hard routes. And often it’s as much of a psychological battle as it is a physical one. If you’re not thinking right it doesn’t work. It has to do with the pressure you feel, the attachment to a goal. CS: Well if you become too attached, it kind of prohibits you from being in the moment, which is when you’re climbing your best, and just enjoying it. So it’s this balance. And it’s kind of a paradox, because when you try something at your very limit, you have to want it more than anything—you have to be so attached to it! ​Around two years ago I was climbing on La Dura Dura [a 5.15c route in Catalonia, Spain, that is considered the world’s hardest climb]. For me I’ve always been just kind of a lifestyle climber, I’ve never really specifically trained—just kind of had fun with climbing. But I got to this point where I wanted to see how hard I could climb if I really pushed it, if I truly became an athlete, and gave myself completely to a project. And I proved to myself that I could climb at the highest level possible. [It took him and Adam Ondra two years, working together, to complete the route]. After that, it was interesting how I was psyched to get back to the fun side of climbing. For a year and a half I went travelling, deep water soloing, bouldering. I kind of got back in touch with the spontaneous side of climbing, where you’re in nature with your friends, having fun, being creative, being spontaneous, not so stuck on a single project. So, having proved something to yourself, are you done with those big, time-consuming, resume-type projects? CS: Well, actually, in this last year, I’ve been back climbing really hard. I just did a climb called El bon combat, also one of the most difficult routes in the world. But it was such a different experience, because in many ways I feel like I don’t have anything to prove. There was no psychological side to it. It was just for fun. And it was so joyful. Which was really different. And it was neat because that freedom, in a way, actually enables you to climb harder. And then it was time to get a little variety in your life, and climb a tree? CS: This is always something I’d dreamed of doing. The concept, in climbing these trees, is how we can go to places we’ve been to, many times, but see them in new ways. It happens all the time when I go climbing. I’ll get to some area I’ve been to a hundred times and think, ‘Huh! How come I never considered climbing that section?’ And it’s been in front of your face the whole time. I grew up in Santa Cruz, got into rock climbing, travelled the world, with a big chunk of that time in Europe, where it’s common to find these tufa features, ribs of stone formed by mineral deposits over thousands of years. A lot of climbing in Europe is on these stalactites, or tufas. Like the bark on a redwood? CS: Right, so now I’m coming home and coming full circle, seeing an amazing opportunity to climb these same trees I grew up around, realizing it’s the same style of climbing as if they were tufas. Plus, for me I’ve always liked taking different styles and mixing them together, like taking the dynamic movements of bouldering and mixing that with sport climbing, and then pushing that even further, free-soloing over the ocean. In life, there are different ways of progressing. Pure difficulty—that’s obviously an important part of the progression, important for me, anyway. And there’s the progression of going to new places, and finding new ways to do things, using the skills you’ve learned in the past and applying them to something new, creating a fusion of styles. So it’s kind of cool that with this project, I can see my whole life, in a way, leading me up to this.